I plan to operate with WØGJ and WAØMHJ for the ARRL DX SSB contest in Turks and Caicos. We are bringing Mark along to help and anyone who knows Mark knows that he is a strong contester! We should arrive in Providenciales two days ahead of the contest and be on the bands. Look for me on the WARC bands. QSL 100% via BURO or with SASE. US Hams please send SASE and not via BURO. FLASH - VP5H paced First in the World MSHP category for the contest !!!! Congratulations to my teammates Glenn Johnson and Mark Endorf. Thanks to Jody for having a great place to operate and to Force 12 for building the world class antennas we used to win! I was at Dayton in May and at Contest U. It was great meeting all of my friends from around the world who were there and especially nice to see Dennis Motschenbacher healthy again. I attended Dayton with W0GJ, W5DNT K4IU, K0UH and W0AIH. They were a great gang to hang around with. Contest U was the best. THANKS Tim Duffy and the faculty! I attended the WØDXCC meeting in Kansas City, MO. It was the best forum in 2011 on Dxing and operating HF radios I have attended. Kudos to the Kansas City Club, The Missouri DX and Contest Club and the many others who participated to make it outstanding. I hope to QRV as CE2/KØMD for a few afternoons around 2200Z to 0100 Z. Look for me on 20 meter CW and perhaps 15 meters. I hope to be in Chile August 15-19, 2011 or so. 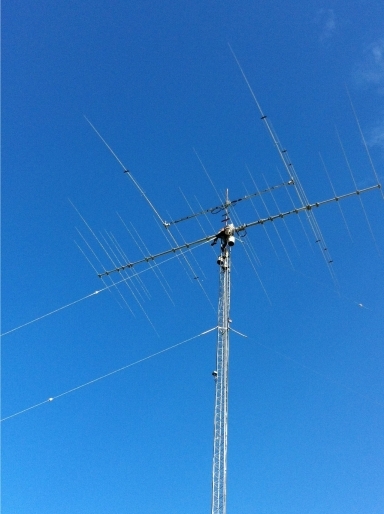 I visited CE2/VE7SV and operated his K-3 and Acom 1000 from atop of his condo (contest suite) in Renaca, Chile. Renaca is 5 km north of Vina del Mar. Dale was a great host. He has a superb set-up to operate. Glenn, Mark and I returned to Provo for the ARRL DX SSB contest at Jody's place. We used an Icom 7600 and an Acom 2000a. Band conditions were great and we made a lot of QSO's. I also got on as VP5/K0MD on the WARC bands. I enjoyed all of the QSO's. Please write me if you need a QSL. I plan to QRV as CE2/K0MD from Vina del Mar, Chile. Please watch for me. I will be busy with meetings as well while there so time on the air will be limited.